What Is Soil Nail Wall Construction? Soil nail wall construction is a technique used to bring soil stability in areas where landslides might be a problem. Soil nail can prevent landslides by inserting steel reinforcement bars into the soil and anchoring them to the soil strata. It is called Soil Nail because it’s like having a nail being hammered into the soil, where the nails are the steel bars. Depending on the complexity of the work, soil nailing can be ranging between $80 per square foot up to $200 per square foot. Some contractors will use a software called Snail Plus to determine their design and complete preliminary assumptions on the soil nailing. Soil Nail walls are not recommended to use on clayey soils, and or clean sands where the cohesion of the soil is minimum. The FHWA reported that the cost for this type of structure ranges from approximately $70 to $100 per square foot of a wall. Soil nail wall provides a resisting force against slope failures. Its construction process is faster than other similar methods. The construction procedure starts, drilling into the soil, where the nail, steel bar, is going to be placed. 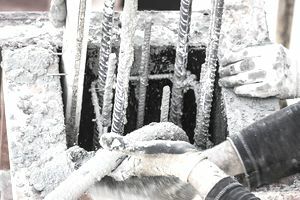 After the drilling has been completed, exact depth must be provided by the geotechnical engineer, the nail must be inserted into the drilled hole. Then, it must be grouted into the soil to create a structure similar to a gravity wall. After placing the nail, a shot-Crete layer is usually placed as a facing material, to protect the exposed nail, and then other architectural options are placed over the shot-Crete, creating an aesthetic finish to the project. Steel tendons typically used for drill-and-grout soil nails usually consist of 0.8 to 2.0-inch bars with a yield strength in the range of 60 to 72 KSI. Drainage is a critical aspect of soil nail wall construction. Face drainage is virtually always used with permanent walls, and very commonly used with temporary walls. Face drainage usually consists of synthetic drainage elements placed between the shot-Crete and the retained soil and may be typically 8 to 12 inches wide synthetic strips or perforated pipes. The grouted soil nail hole typically has a minimum diameter of 4 inches. Centralizers are placed around the soil nail to maintain an even thickness of grout around the bar. For permanent applications, nails may be epoxy-coated or provided with a protective sheath for corrosion protection. It is ideal for tight spaces. It can be used in irregular shapes. Less noise and fewer traffic obstructions. Less impact on surrounding areas. Requires less working area and ROW than traditional methods. Lower load requirements than tieback anchors systems. Eliminates the time and expense of placing steel piles. Can be used to repair other existing wall systems. It can be used on new constructions, as temporary structures or on remodeling process. Wall height is not restricted. In some instances, the soil might be overexposed prior to the installation of the nail. Sand and gravels might not be compatible with soil nailing. Not recommended to use in areas of a high water table. Soil nailing in very low shear strength soil may require a very high soil nail density. Soil nailing in sensitive soils and expansive soils for permanent long-term applications is not recommended.